AS 2015 approached its conclusion one team had dominated the European football landscape. The five trophies claimed by Barcelona set a standard that many will struggle to match. Just as impressive as the trophy haul are the statistics surrounding the attacking trident of Luis Suárez, Lionel Messi and Neymar, who combined to score an incredible 121 goals in all competitions. To put this in context, the Bayern Munich squad scored a combined 123 goals during the same period. They became the first club in history to repeat the treble of domestic league, cup and Champions League – Pep Guardiola’s inspired 2009 achievement being the club’s first. The capture of Barcelona’s fifth European Cup was made all the more credible by the fact that along the way, they defeated the reigning champions of England, France, Germany, and finally Italian title holders Juventus in the final. Lovers of the old European Cup era would have tipped a cap to the achievement. The current Barcelona model and the business logic that lies beneath the success is far removed from the club that construction magnate Josep Lluís Núñez took over as president of in 1978. Back then it was a club reeling from the summer departure of Johan Cryuff. When Núñez arrived, he immediately set about his principal aim of turning Barcelona into the biggest sporting club in the world. The financial mismanagement of the club through the years led to Núñez establishing a blueprint for the club to produce its own players. As a result of Núñez’s prioritisation on investing in youth, the famed academy La Masia was established. In turn, this would negate the requirement to outlay large transfer fees and wages. As always with both Barcelona and Real Madrid, the constant need to maintain superiority over one another contributed to an ever-changing dressing room and in particular the managerial hot-seat. Under Núñez, this was no different. Appointing German Udo Lattek in the summer of 1981 increased Núñez’s resolve to capture Barcelona’s first La Liga title since 1974, however above all he craved a maiden European Cup win. Madrid’s six European Cup titles had always been a reminder to Barcelona of their illustrious history. The expansion of Barcelona’s brand continued at pace under the Spaniard’s stewardship. Membership of the club increased – peaking at almost 106,000 members – and a third tier was added to Camp Nou in preparation for hosting matches during the 1982 World Cup finals. On the playing front, Dane Allan Simonsen and the notoriously pragmatic German Bernd Schuster were added to a squad bustling with talent. Núñez, however, craved a signing that would signal Barcelona’s attempt to put a stranglehold on both domestic and European football. By the time the World Cup finals arrived in Spain, anticipation was feverish regarding the projected world record signing of Argentine prodigy Diego Maradona from Boca Juniors. The completion of the transfer was finally pushed through on 28 May 1982 to avoid a possible counter offer by Italian Champions Juventus, who instead purchased Michel Platini. The player finally arrived in Barcelona on 4 June to formally sign the contract, accompanied by his agent Jorge Cyterszpiler. The final fee paid was $7.7 million, with $2.2 million being paid to Maradona’s former employers Argentinos Juniors. The performance of Maradona during the World Cup gave Barcelona officials a glimpse of his volatile nature, and his sending off for kicking out at Brazilian player João Batista da Silva offered a stark insight into what lay ahead. By the end of 1982, cracks had already begun to emerge in the player-club relationship. Lattek had become antagonised by the continued presence of Cyterszpiler and he eventually banned the agent and the player’s increasingly expanding entourage from the training ground. The entourage now included a personal trainer, Fernando Signorini, hired by Maradona to increase his fitness after a bout of hepatitis sustained in late ‘82, a personal cameraman and a chauffeur. In the background, Cyterszpiler had dipped into the player’s vast incomings to start up ‘Maradona Productions’, which was designed to export Maradona’s image rights across the globe. By the first few months of 1983, rumours began to circulate of drug taking amongst the entourage. Lavish nights out with fellow Argentine residents had begun to draw a wedge between Maradona and President Núñez. Following defeat to Austria Vienna in the European Cup Winners’ Cup quarter-final, Lattek was relieved of his duties and replaced by 1978 World Cup-winning manager César Luis Menotti. A return to form for Maradona, possibly brought on by the appointment of countryman Menotti, towards the end of the 1982-83 season led to victory in the Copa del Rey at the expense of arch-rivals Real Madrid. The season ahead offered Núñez and the Socios renewed hope of capturing a first league title in 10 years, however what transpired would leave the president and his club with no option but to terminate the contract of their world record signing. Athletic Bilbao, managed by Javier Clemente, had emerged from the shadows of the big two and claimed the previous year’s league title. Combining a mix of aggression and power, they arrived at Camp Nou in September 1983 determined to show they would not be knocked off their pedestal. 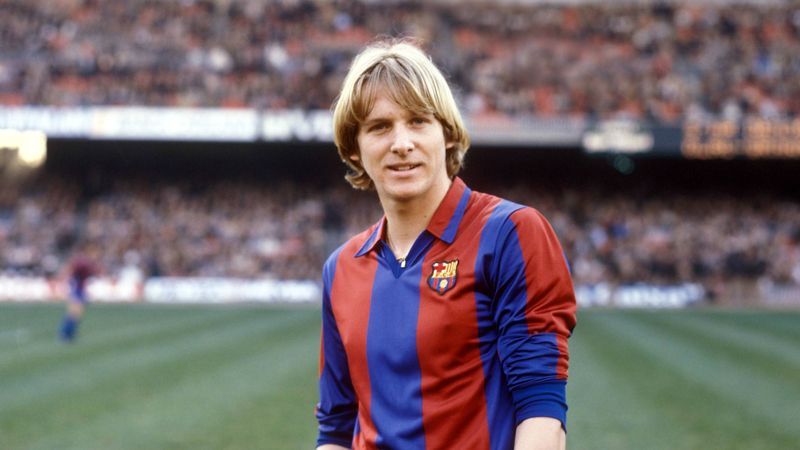 Barcelona fans were still mindful of the tackle that saw Bernd Schuster suffer a broken leg in the 1981 clash. The perpetrator of the Schuster tackle had been Andoni Goikoetxea. A no-nonsense defender with an eye for goal, his scything tackle that September night on Maradona lives long in the memory for its brutality. It earned the player the moniker of ‘The Butcher of Bilbao’, a 10-match ban and resulted in a broken ankle for Maradona. Rumour has it Goikoetxea retained the boot used to simulate the attack and proudly displayed it at parties some years later. Barcelona’s season never recovered and Athletic claimed a second consecutive La Liga title. By now a mutual antipathy had enveloped between Catalans and Basques and was encapsulated by the Barça-Athletic rivalry. As the season drew to a close the Copa del Rey Final on 5 May between the two clubs was looming. The pre-match build-up included caustic comments from both sides. This turned the Santiago Bernabéu into a cauldron of tension – and it was only a matter of time before events took a turn for the worst. Athletic took an early lead that they would not surrender. 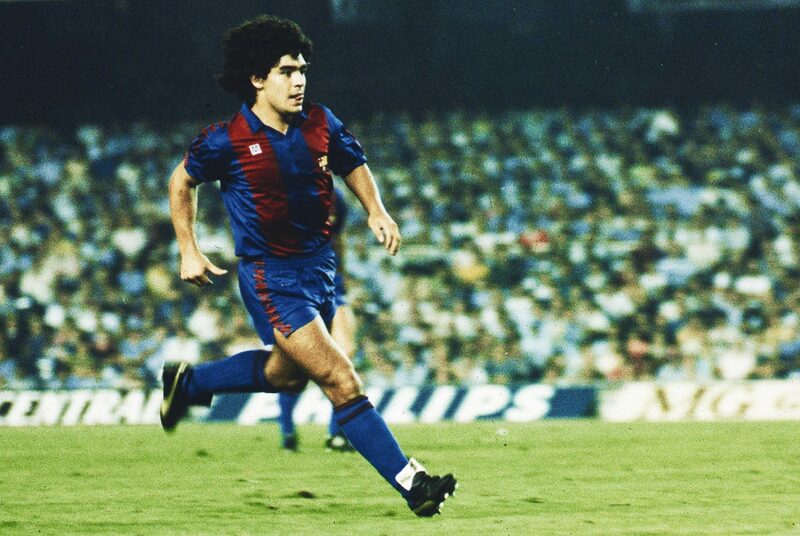 During the course of the 90 minutes, Maradona had been goaded throughout by Miguel Sola. When the referee signalled for the end of the match, it triggered a mass brawl involving all 22 players. The high kick received to the chest by Maradona from his old adversary, Goikoetxea, was the low point on a dreadful night for Spanish football. The match, attended by King Juan Carlos, brought shame to the Barcelona directors and in particular President Núñez. At that moment he decided that Maradona was out of control and the club could no longer continue with him amongst its ranks. By now, Maradona’s production company, started by Cyterszpiler, had run up vast financial losses. The agent acknowledged that both player and club had outgrown each other and he began a tendering process by sounding out a possible transfer to Italy. The Italian league at this point in time was awash with star players and, most importantly, the monetary means to wipe clear the company’s losses. Back in Barcelona, Maradona had lost a key ally in Menotti, who had been dismissed as manager by Núñez. Having initially sounded out Bobby Robson, he was alerted by Robson to a young, up and coming coach who would ingrain the hard working philosophy that Núñez believed was lacking under Menotti’s casual style of management. As a result, an unexpected call was placed to QPR manager Terry Venables. Having just guided the Londoners to a fifth place finish that season, it was an opportunity that Venables could not turn down, and on 24 May 1984, he was officially announced as the new Barcelona manager, the seventh of the Núñez reign. Venables immediately walked right into the Maradona-Barcelona storm. Due to the player’s increasingly precarious financial situation and the fallout from the Copa final, he was instructed that Maradona needed to be sold as soon as a credible buyer could be found. Meanwhile, Cyterszpiler had made headway with both Juventus and Napoli. The Turin club had the financial clout to complete a deal quickly, the stumbling block being the presence of Michel Platini in the number 10 role. What developed was a 43-day stand-off between Núñez, Maradona, Cyterszpiler and Napoli before local politician and future Government minister, Vincenzo Scotti, obtained a bank loan for the £7 million needed to sign Maradona. Back in Catalonia, Venables had the unenviable task of trying to replace Maradona. The Barcelona board and in particular Joan Gaspart, unbeknown to Venables, had targeted Atlético Madrid’s Mexican centre-forward Hugo Sánchez to fill the void. On completion of the transfer talks with Gaspart, Sanchez gave an interview to Catalan-based newspaper Sport announcing his excitement at joining Barça. The manager, however, had different ideas and reverted to what he knew. The sight of the Scottish striker beside President Núñez did not amuse the Barcelona press who christened him ‘Steve Who?’ For the penny-pinching Nuñez, Archibald represented a low-risk investment, symptomatic of his reign. Opting not to sign Sánchez would come back to haunt Núñez and Barcelona. Venables needed a quick start to satisfy the cautious Catalans and he got it with an opening day 3-0 victory against Real Madrid. By the end of 1984, Barcelona, under Venables, were a well-organised unit. The initial scepticism had now given way to renewed hope of a potential league title. Archibald revelled in his first season, scoring 15 league goals and proving popular amongst both supporters and players alike. Venables also appeased Núñez by promoting from the youth set-up. His high-pressing, high-tempo style differed greatly from that of his predecessor Menotti. By the close of the season, Barcelona comfortably wrapped up a first league title in 11 years. During the course of the league season they lost only twice and finished 11 points ahead of second place Atlético Madrid. Núñez’s gamble on appointing ‘Meester’ Venables had handsomely paid off. Immediately, however, his thoughts turned to a greater prize, the one trophy that had eluded Barcelona: the European Cup. Barcelona’s path to the European Cup had been made all the easier by the fact that English clubs had now been banned indefinitely from European football in the wake of the Heysel Stadium disaster. Barça being Barça, life was never easy and they scraped past Sparta Prague on away goals in the first round before again relying on the away goals rule to defeat Porto in round two. At this point retaining the league title had become secondary in the minds of Venables and Núñez. The acid test would come in the quarter-final against the defending champions Juventus. Holding a narrow first leg home victory, Archibald silenced the Stadio Communale with the opening goal and, although Platini equalised, it was the Spaniards who advanced to a semi-final meeting with IFK Göteborg. Unexpectedly, it was a semi-final tie that would long in the memory. The Swede’s raced into a 3-0 first leg advantage, catching out Venables’ side with their direct style on a partially frozen pitch. A miracle was required if the Spaniards were to advance. The miracle was provided in the shape of Pichi Alonso, a third choice striker. The final, on 7 May in Seville, was expected to be a procession for Barcelona’s coronation. The opposition were the dour counter-attacking Romanians Steaua Bucharest. A partisan crowd packed the Sánchez Pizjuán expecting a landslide victory. Instead, what they got would take Barcelona six years to recover from. The Spaniard’s defeat on penalties and the fallout from it has been well documented down through the years – Schuster storming off when substituted on 85 minutes didn’t help dressing room morale. The paranoia associated through years of defeats had returned in the cruellest of manners. Defeat to Steaua was a seismic event that Venables’ Barcelona career never fully recovered from. Despite signing Gary Lineker and Mark Hughes in the summer of 1986, and finishing second to Real Madrid in that season’s La Liga, he was eventually relieved of his duties in September 1987 following a slow start to the campaign. 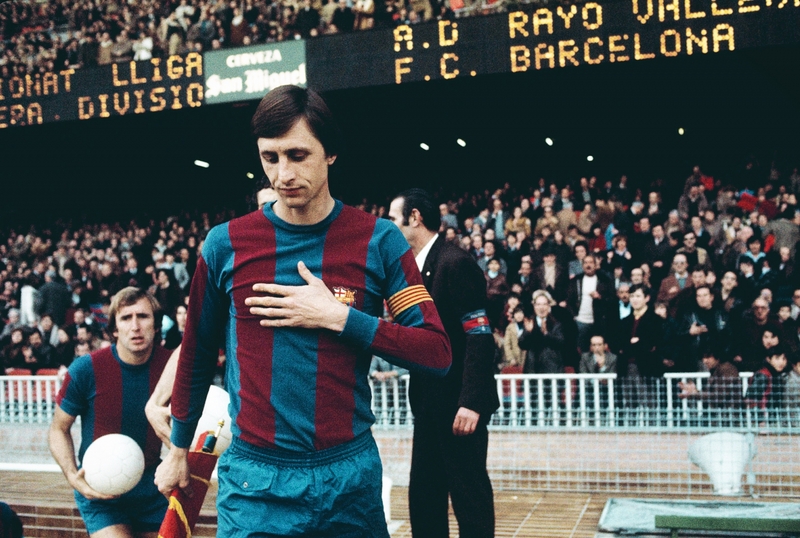 It would be another year before the returning Johan Cruyff would begin the revolution that changed Barcelona forever. Part of his Dream Team would be that ball boy from 1986, Pep Guardiola. Behind it all stood President Núñez. Twenty-two years into his campaign he finally relinquished control in 2000. Barcelona had, however, finally reached his principal aim. They had, for many, become the finest sporting institute in the world, as well as European Cup winners.